A scope is a specific area of code that is partially isolated from other areas of code. Resource titles, which are all global. Resource references, which can refer to a resource declared in any scope. A particular scope has access to its own contents, and also receives additional contents from its parent scope, node scope, and top scope. The rules for how Puppet determines a local scope’s parent are described in scope lookup rules. Top scope can access variables and defaults only from its own scope. The example::child class can access variables and defaults from its own scope, the example::parent scope, node scope, and top scope. Code inside a node definition exists at node scope. Only one node scope can exist at a time because only one node definition can match a given node. Variables and defaults declared in a local scope are only available in that scope and its children. There are two different sets of rules for when scopes are considered related. For more information, see scope lookup rules. Variables and defaults declared at node scope can override those received from top scope. Those declared at local scope can override those received from node and top scope, as well as any parent scopes. If multiple variables with the same name are available, Puppet uses the most local one. Resource defaults are processed by attribute rather than as a block. Thus, defaults that declare different attributes are merged, and only the attributes that conflict are overridden. Variables provided by an ENC are set at the top scope. However, all of the classes assigned by an ENC are declared at the node scope. This results the most expected behavior: variables from an ENC are available everywhere, and classes can use node-specific variables. Note: This means compilation fails if a site manifest tries to set a variable that was already set at top scope by an ENC. Variables declared in named scopes can be referenced directly from anywhere, including scopes that otherwise would not have access to them, by using their qualified global name. A class must be declared to access its variables; just having the class available in your modules is insufficient. This means the availability of out-of-scope variables is evaluation-order dependent. You should only access out-of-scope variables if the class accessing them can guarantee that the other class is already declared, usually by explicitly declaring it with include before trying to read its variables. Because the top scope’s name is the empty string, $::my_variable refers to the top-scope value of $my_variable, even if $my_variable has a different value in local scope. Variables declared in anonymous scopes can only be accessed normally and do not have qualified global names. Dynamic scope for resource defaults. Classes can receive parent scopes by class inheritance, using the inherits keyword. 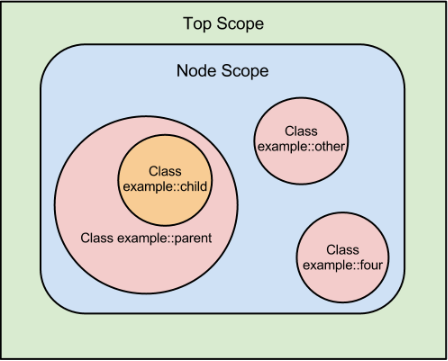 A derived class receives the contents of its base class in addition to the contents of node and top scope. All other local scopes have no parents — they receive their own contents, the contents of node scope (if applicable), and top scope. Scope contents can be determined simply by looking at the relevant class definition; the place where a class or defined type is declared has no effect. The only exception is node definitions — if a class is declared outside a node, it does not receive the contents of node scope. Each scope has only one parent, but can have an unlimited chain of grandparents, and receives the merged contents of all of them, with nearer ancestors overriding more distant ones. When you declare a derived class whose base class hasn’t already been declared, the base class is immediately declared in the current scope, and its parent assigned accordingly. This effectively “inserts” the base class between the derived class and the current scope. If the base class has already been declared elsewhere, its existing parent scope is not changed. A scope’s parent cannot be identified by looking at the definition of a class — you must examine every place where the class or resource might have been declared. Since classes can be declared multiple times with the include function, the contents of a given scope are evaluation-order dependent.